On the 12th (Mon), contemplate the long history of Piazza dei Signori, then take in the architecture and atmosphere at Church of Santa Maria e San Donato, then view the masterpieces at Martina Vidal Venezia, and finally contemplate in the serene atmosphere at Basilica di Santa Maria Assunta e Chiesa di Santa Fosca. On the next day, kick back and relax at Spiaggia di Ca' Ballarin, contemplate the long history of Centro Storico di Treviso, and then appreciate the extensive heritage of Passeggiata lungo la restera. To find maps, traveler tips, more things to do, and more tourist information, read our Venice online trip builder . Brisbane, Australia to Venice is an approximately 26-hour flight. You can also do a combination of flight and train; or do a combination of flight and shuttle. You'll gain 9 hours traveling from Brisbane to Venice due to the time zone difference. Traveling from Brisbane in August, expect Venice to be somewhat warmer, temps between 34°C and 22°C. Finish your sightseeing early on the 13th (Tue) so you can drive to Bologna. Get some cultural insight at Bergogno Borgo Medioevale and Via del Borgo o degli Asini. Explore hidden gems such as Lodi Corazza and Piazza Grande. Change things up with these side-trips from Bologna: International Ceramic Museum (in Faenza), Via delle Volte (in Ferrara) and Casa Museo Luciano Pavarotti (in Modena). Next up on the itinerary: steep yourself in history at Basilica di San Domenico and pause for some serene contemplation at Cattedrale di San Pietro. For maps, reviews, where to stay, and tourist information, read Bologna trip planner . Getting from Venice to Bologna by car takes about 2 hours. Other options: take a train; or take a bus. In August in Bologna, expect temperatures between 36°C during the day and 22°C at night. Cap off your sightseeing on the 16th (Fri) early enough to travel to Portoferraio. Portoferraio is a town and comune in the province of Livorno, on the edge of the eponymous harbour of the island of Elba. Relax by the water at Spiaggia Luisi d'Angelo and Spiaggia delle Tombe. Your cultural itinerary includes sights like Miniere di Capoliveri and Castello del Volterraio. Change things up with these side-trips from Portoferraio: Spiaggia di Chiessi (in Chiessi), Spiaggia di Terranera (in Porto Azzurro) and Spiaggia di Remaiolo (in Capoliveri). There's still lots to do: stroll through Spiaggia di Seccione, kick back and relax at Spiaggia Canata, look for gifts at Gelateria Zero Gradi, and meet the residents at Acquario dell'Elba. To find reviews, traveler tips, maps, and more tourist information, you can read our Portoferraio trip itinerary app . You can do a combination of car and ferry from Bologna to Portoferraio in 4 hours. Other options are to do a combination of train and ferry; or do a combination of bus and ferry. When traveling from Bologna in August, plan for slightly colder days and about the same nights in Portoferraio: temperatures range from 33°C by day to 23°C at night. Cap off your sightseeing on the 21st (Wed) early enough to travel to Assisi. 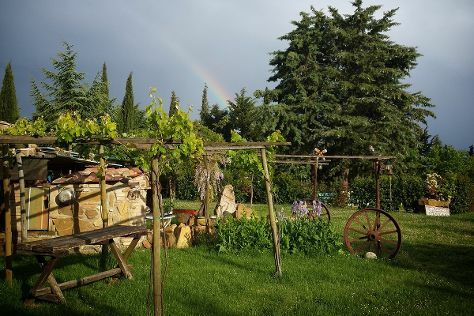 You'll explore the less-touristy side of things at Azienda Agricola Leuta and Belvedere di Cortona. You'll get in some beach time at Baia Canaria and Islamorada - Dog Beach. Change things up with these side-trips from Assisi: Tenuta Castelbuono (in Bevagna), Cantina Peppucci (in Todi) and Basilica di San Salvatore (in Spoleto). There's lots more to do: do a tasting at Romanelli Agricola, delve into the distant past at Museo Diocesano e Cripta di San Rufino, take in the architecture and atmosphere at Chiesa Santo Stefano, and look for gifts at DelBrenna Jewelry. To find reviews, maps, more things to do, and more tourist information, read Assisi online holiday maker . Traveling by combination of ferry and car from Portoferraio to Assisi takes 4.5 hours. Alternatively, you can do a combination of ferry, train, and bus; or do a combination of ferry and train. Traveling from Portoferraio in August, Assisi is little chillier at night with lows of 20°C. Wrap up your sightseeing on the 26th (Mon) to allow time to drive to Orvieto. Your cultural itinerary includes sights like Podere Il Cocco and San Quirico d'Orcia. Discover out-of-the-way places like La Feniglia and Marina di Alberese. Get out of town with these interesting Orvieto side-trips: Cala Mar Morto (in Porto Santo Stefano), Ciacci Piccolomini d'Aragona (in Castelnuovo dell'Abate) and Museo Nazionale Tarquiniense (in Tarquinia). The adventure continues: don't miss a visit to Terme Bagno Vignoni, take in the architecture and atmosphere at Pieve di San Nicola, contemplate the long history of Centro Storico di Capalbio, and enjoy breathtaking views from Torre del Moro. To find other places to visit, reviews, more things to do, and other tourist information, use the Orvieto attractions planning site . Drive from Assisi to Orvieto in 1.5 hours. Alternatively, you can take a train; or take a bus. August in Orvieto sees daily highs of 36°C and lows of 21°C at night. Wrap up your sightseeing on the 31st (Sat) early enough to take a train to Rome. Eschew the tourist crowds and head to Lido Riviera and Monastero Di S.Benedetto. Do some cultural sightseeing at Cantina Terenzi and Foro Emiliano. Explore the numerous day-trip ideas around Rome: Spas & Wellness (in Fiuggi), Spiaggia di Torre Paola (in Sabaudia) and Anagni (Cattedrale di Santa Maria - sec. XI-XII & Museo e Cripta della Cattedrale di Anagni). Next up on the itinerary: stroll through Stabilimento Balneare Amerigo, take an in-depth tour of Castello Odescalchi, learn about winemaking at Cantina Castello di Torre in Pietra, and delve into the distant past at Rieti's Underground. For where to stay, photos, ratings, and tourist information, use the Rome online vacation planner . Take a train from Orvieto to Rome in an hour. Alternatively, you can drive; or take a bus. In August, plan for daily highs up to 38°C, and evening lows to 24°C. Cap off your sightseeing on the 5th (Thu) early enough to travel to Alghero. Your cultural itinerary includes sights like Azienda Agricola Leda' d'Ittiri and Nuraghe Sant'Antine. Step off the beaten path and head to Porto Palmas Beach and Spiaggia di Balai. Explore Alghero's surroundings by going to Basilica San Gavino (in Porto Torres), Cattedrale di Sant'Antonio Abate e Museum Ampuriense (in Castelsardo) and Sassari (spiaggia di Porto Ferro & Cattedrale di San Nicola). There's still lots to do: do a tasting at Cantina Ligios, tour the pleasant surroundings at Porto Alabe Beach, take in the architecture and atmosphere at Cattedrale di Santa Maria, and explore the ancient world of La Necropoli di Anghelu Ruju. For ratings, reviews, other places to visit, and other tourist information, read Alghero trip planner . Getting from Rome to Alghero by flight takes about 4 hours. Other options: do a combination of ferry and car; or do a combination of train, ferry, and bus. In September, daytime highs in Alghero are 32°C, while nighttime lows are 18°C. Finish up your sightseeing early on the 10th (Tue) so you can go by car to Cabras. 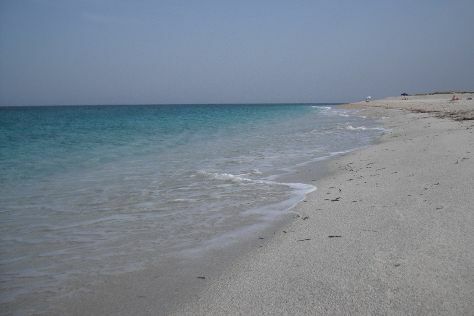 Visit Capo San Marco and Spiaggia Mari Ermi for some beach relaxation. Step off the beaten path and head to Maimoni Beach and Sa Mesa Longa. You'll find plenty of places to visit near Cabras: Casa Museo di Antonio Gramsci (in Ghilarza), Menhir di Biru 'e Concas (in Sorgono) and Fordongianus (Spas & Wellness & Casa Aragonese). For maps, where to stay, photos, and other tourist information, you can read our Cabras trip planner. 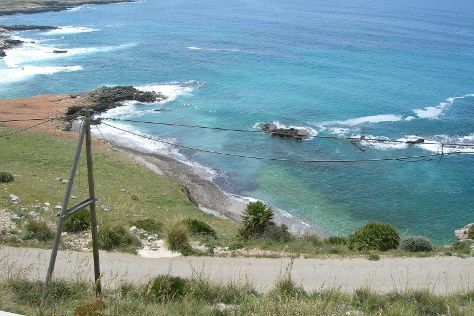 Traveling by car from Alghero to Cabras takes 2 hours. Alternatively, you can take a bus; or take a train. In September, daily temperatures in Cabras can reach 34°C, while at night they dip to 20°C. Finish up your sightseeing early on the 15th (Sun) so you can travel to Carloforte. Carloforte is a fishing and resort town of located on Isola di San Pietro, approximately 7km off the southwestern coast of Sardinia, in southern Sardinia, Italy.HistoryAccording to a legend, a local church was founded in the early 14th century in honour of hundreds of participants to the so-called Children's Crusade of 1212 who perished in a shipwreck just off the island on their way to North Africa during a gale. Get a sense of the local culture at Museo del Bisso di Chiara Vigo and Laveria Lamarmora. Eschew the tourist crowds and head to Spiaggia di San Nicolo' and Dido Beach. Change things up with a short trip to Antica Tonnara di Porto Paglia in Gonnesa (about 58 minutes away). There's more to do: kick back and relax at Punta Delle Colonne and tour the pleasant surroundings at Spiaggia di Cala Fico. For other places to visit, ratings, traveler tips, and other tourist information, go to the Carloforte trip itinerary planning site . Getting from Cabras to Carloforte by car takes about 3 hours. In September in Carloforte, expect temperatures between 34°C during the day and 20°C at night. Finish up your sightseeing early on the 18th (Wed) so you can travel to Cagliari. Get some cultural insight at Il Belvedere di Nebida and Museo del Tesoro e Area Archeologica di Sant'Eulalia. Your itinerary includes some good beach time at Spiaggia di Solanas and Spiaggia di Piscadeddus. Change things up with these side-trips from Cagliari: Torre di Barì (in Bari Sardo), Su Sirboni Beach (in Marina di Gairo) and Spiaggia di Masua (in Iglesias). There's still lots to do: get a dose of the wild on a nature and wildlife tour, browse the eclectic array of goods at San Benedetto market, examine the collection at Cittadella dei Musei, and enjoy breathtaking views from Tower of San Pancrazio. To find other places to visit, more things to do, ratings, and tourist information, you can read our Cagliari travel route site . Traveling by car from Carloforte to Cagliari takes 2.5 hours. In September, daily temperatures in Cagliari can reach 33°C, while at night they dip to 20°C. Finish your sightseeing early on the 22nd (Sun) to allow enough time to travel to Matera. You'll explore the less-touristy side of things at Lido Zanzibar and Costa Dei Trulli. Your cultural itinerary includes sights like Santuario Santa Maria di Anglona and L'Acropoli di Puglia. Change things up with these side-trips from Matera: I Pastini (in Martina Franca), Cattedrale di Ruvo di Puglia (in Ruvo Di Puglia) and Pinacoteca Giuseppe De Nittis (in Barletta). There's still lots to do: contemplate the waterfront views at Riserva Naturale della Foce del Fiume Chidro, appreciate the extensive heritage of Piazza Vittorio Veneto, make a trip to Chiese rupestri Madonna delle Virtu e San Nicola dei Greci, and take in the spiritual surroundings of Chiesa del Purgatorio. To find other places to visit, traveler tips, more things to do, and tourist information, go to the Matera trip itinerary builder website . Traveling by combination of flight and bus from Cagliari to Matera takes 4.5 hours. Alternatively, you can do a combination of ferry and car; or do a combination of ferry and bus. Prepare for slightly colder weather when traveling from Cagliari in September: high temperatures in Matera hover around 29°C and lows are around 17°C. Wrap up your sightseeing on the 27th (Fri) early enough to travel to Palermo. Relax by the water at Spiaggia di Macari and Spiaggia Zero Barriere. Explore hidden gems such as Cala dell'Uzzo and EL RIO Beach Bar. You'll find plenty of places to visit near Palermo: Teatro Greco di Segesta (in Calatafimi-Segesta), IL Duomo (in Erice) and CIDMA: Mafia and Anti-Mafia Center Guided Visits (in Corleone). There's still lots to do: don't miss a visit to Baia Santa Margherita, Castelluzzo di S.Vito Lo Capo, take in the spiritual surroundings of San Giuseppe dei Teatini, take in the architecture and atmosphere at Santuario Di San Vito, and look for all kinds of wild species at Riserva Naturale Dello Zingaro. To see more things to do, where to stay, photos, and more tourist information, you can read our Palermo trip maker app . You can do a combination of bus and flight from Matera to Palermo in 5.5 hours. Alternatively, you can do a combination of bus and flight; or do a combination of car and ferry. Finish your sightseeing early on the 2nd (Wed) to allow enough time to drive to Taormina. Get a sense of the local culture at Chiesa Madonna della Rocca and Duomo di Taormina. You'll enjoy a bit of beach vacationing at Spiaggia Capo Calava and Lido La Dolce Vita. 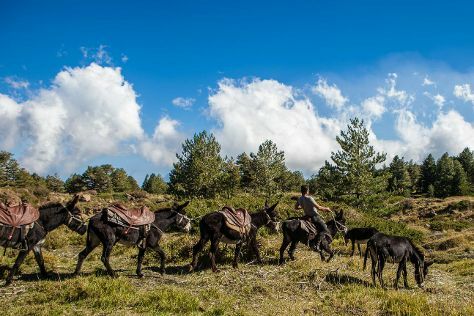 Explore the numerous day-trip ideas around Taormina: Etna Donkey Trekking (in Linguaglossa), Riserva Naturale Orientata Laghetti di Marinello (in Patti) and Grotte Beach Mongiove (in Mongiove). Next up on the itinerary: make a trip to Piazza IX Aprile, get outside with EtnaExcursion.it, see the interesting displays at Pavone Francesco, and kick back and relax at Spiaggia San Gregorio. To find traveler tips, other places to visit, photos, and more tourist information, read Taormina trip itinerary planner . Getting from Palermo to Taormina by car takes about 3 hours. Other options: take a train; or take a bus. In October, daily temperatures in Taormina can reach 28°C, while at night they dip to 20°C. On the 8th (Tue), wrap the sightseeing up by early afternoon so you can travel back home.